Sprinkle the chicken pieces with 1 teaspoon of each salt and pepper. Dredge the chicken pieces in the flour to coat lightly. In a large heavy saute pan, heat the oil over a medium-high flame. Add the chicken pieces to the pan and saute just until brown, about 5 minutes per side. If all the chicken does not fit in the pan, saute it in to batches. Transfer the chicken to a plate and set aside. Add the bell pepper, onion and garlic to the same pan and saute over medium heat until the onion is tender, about 5 minutes. Season with salt and pepper. Put the sauteed vegetables into a pressure cooker. Add the wine and simmer until reduced by half, about 3 minutes. Add the tomato paste, then tomatoes with their juice, broth, capers and oregano. Place a steamer stand in the pressure cooker and stack the chicken pieces on the stand. Cover and pressure cook for 10-15 minutes. Use the natural release method. Remove the chicken with tongs and set aside. Stir in the peas and carrots. If necessary, boil the sauce until it thickens slightly, about 3 minutes. Spoon off any excess fat from atop the sauce. Spoon the vegetable mixture and sauce over the chicken, then sprinkle with the basil and serve. 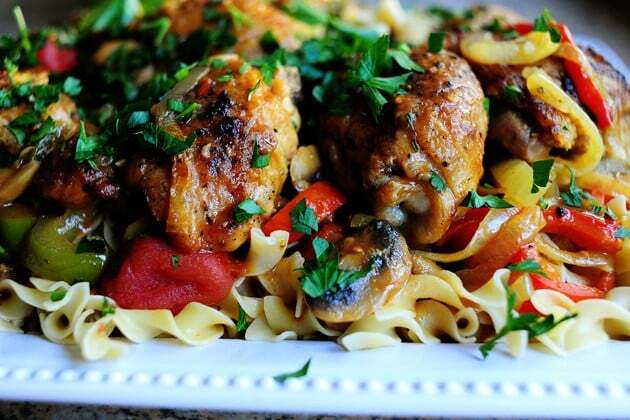 Serve the sauce and chicken over noodles or serve with rice. The peas and carrots are optional but add texture and flavor to this dish. Experiment with adding more vegetables like Brussel sprouts and cauliflower being careful to not over cook them.